The third piece of the Larsen Ice Shelf broke off and now scientists are scrambling to get there to learn more about the ecosystem that lies underneath. 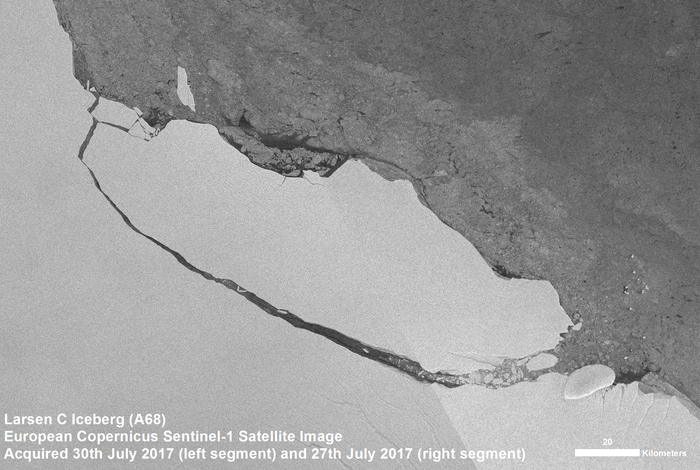 In July of this year, satellite images from the Thermal Infrared Sensor captured the creation of the largest iceberg in recorded history. It’s the size of Delaware. This is the third section of the Larsen ice shelf to break off, with the first part, Larsen A, coming apart in 1995, the second part in 2002 and now the third part this year. The entire Larsen ice shelf was around for thousands of years, a continual staple in the Antarctic. In less than a quarter-century, it has been decimated. So far, scientists haven’t been able to tell if the Larsen C calving event is a direct result of climate change, or if it’s natural, but poorly timed, cycle in the ice shelf. However, when you consider the big picture with the knowledge that the three largest sections of the Larsen shelf have broken apart, the outlook isn’t good. Even with the potential warning signs of climate change this event brings, it’s also presented a unique opportunity. It’s rare for a calving event of this magnitude to happen at all, let alone in an area scientists can try and reach. Scientists have extensive information on the Larsen ice shelf, and people know how to get there. It’s been monitored for years since the crack that eventually led to the iceberg started. Some of the first researchers on the site will be the team that was in charge of project MIDAS, which spent years tracking the rift. Adam Booth, a geophysicist from the University of Leeds, and his team plan to arrive and evaluate the rest of the ice shelf. There’s still a lot of ice left, after all, and it’ll be helpful to use this new open area to monitor the conditions of deeper ice. They’ll see how stable it is and how much it’s changing, then try to use that information to make predictions about the continued health of the ice sheet. The current hypothesis is that the calving and disintegration of the rest of the ice sheet will speed up now. 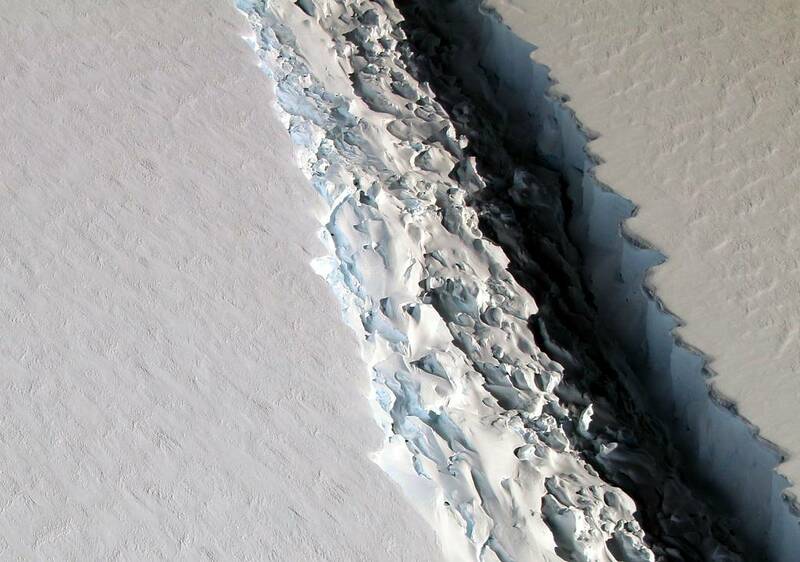 The iceberg that broke off acted as a buttress, helping to keep the more massive ice sheet behind it stable. With that section gone, it’s likely the meltwater will be able to flow through and out of the shelf faster, speeding up its calving and deterioration. Of course, scientists won’t know if that’s the case until they can collect the data. Leading the second team that’s preparing to go is Katrin Linse, a marine biologist with the British Antarctic Survey. This team will try to get there soon enough to observe the marine life that lives beneath the ice. The last time a great calving event occurred in the Larsen shelf, marine scientists got there a little bit later. By then, some of the first creatures from the already exposed ocean floor had moved in. Now, they hope to get there before those initial explorers move in. The ocean floor beneath an ice sheet lacks sunlight, and the water is freezing cold. These conditions may be similar to the deep ocean abyss, with little food or nutrients available and sparse lifeforms. But since it’s not the same ecosystem, it’s entirely possible the team will discover new species. It’s also possible they will find no life. That would probably be a first for any ecosystem on Earth! While a lifeless area would be fascinating, it is unlikely, and Linse and her team are going there with the expectation of finding life. The team will also map the topography of the ocean floor, now that they can. They also plan to take core samples to study the sediment layers. Since the Larsen ice shelf has hidden the ocean floor for at least 120,000 years, these cores could reveal plenty of new information about what the area was like for the last few thousand years. And of course, they’ll take any pictures they can! Part of what they hope to discover is mainly centered on climate change. They want to learn how fast Antarctic marine species can migrate and if they might act as a carbon sink, and try to use them to predict how other aquatic species might react to climate change in such an extreme and specialized environment. This project is even more interesting because the area surrounding the Larsen ice shelf has been exposed to waters that are warming faster than average in the Antarctic. While the calving of the iceberg created a fantastic opportunity, it’s also presenting unpredictable challenges. Getting around in the Antarctic is a challenge on its own, but the Larsen ice shelf has been changing for decades. The ice is weakening as more and more meltwater flows down. Since water is denser than ice, it finds any crack in the ice, slips down and widens that crack. These conditions can make traversing the ice difficult. The teams will use satellite images to plan their route through the sea ice. Once they get there, they’ll only have three weeks to get their work done. Once they are there, not only will they face time constraints, but all the dangers that come with trying to work in the Antarctic — including subzero temperatures for both people and equipment, high winds, constant daylight, limited supplies, storms and diving in the waters there. Right now, the iceberg isn’t quite far enough out for them to explore the area safely, which means the researchers have a very tight schedule to work with. They have to wait a bit longer, but not so long that other sea life takes up residence there. They also will be the first teams to go down to research while abiding by the Commission for the Conservation of Antarctic Marine Living Resources, which created a new international agreement in 2016 regarding the study of newly exposed areas formed by the collapse of sea ice. If everything goes well, the findings these scientists make could inform how these Antarctic ecosystems will react to climate change. Being able to predict their changes give us the best chance of protecting them and the species that live there.